Carburettors on older Land Rovers seem to cause a disproportionate number of problems for owners. In these days of high fuel prices and global warming, it makes a lot of sense to get your vehicle running as well as possible to improve fuel economy and minimise emissions. A decent fuel system will also make your Land Rover a lot easier to live with. So, what carburettor do you have fitted, and what might be up with it? These are not especially common these days - many were replaced with Zeniths or Webers when they developed problems - but they still turn up. A Solex in good condition works very well, with a nice progressive throttle action. They seem quite prone to blocked jets which will cause poor idling, slow pickup or lack of power depending on which jet is affected. The jets are accessible without dismantling the carb, and can be sprayed with carb cleaner and then blown through with an airline to clean them. Do not start poking bits of wire into the jets or you will ruin them. Float needles wear, leading to fuel flooding into the intake - parts were unavailable for a while but the supply seems better now. A worn out Solex can usually be refurbished, there are several specialists who will undertake this work. New Solexes are no longer available. Easy to identify with its large sloping float chamber. The 36IV is a simple, almost primitive device, but well suited to the 2286cc petrol engine. It suffers from throttle spindle wear, which allows excess air to be drawn in at small throttle openings, giving hesitant performance at low speed. There is an 'O' ring between the upper and lower body which can perish or split leading to fuel flooding into the intake. Blocked jets are not unknown - the one that seems to suffer most is the accelerator pump jet, leading to hesitation and flat spots when the throttle is opened from idle. Replacement Zeniths are widely available - I believe the originals are no longer being made, but there are several reproductions also available. Beware as some of these are of very poor quality. 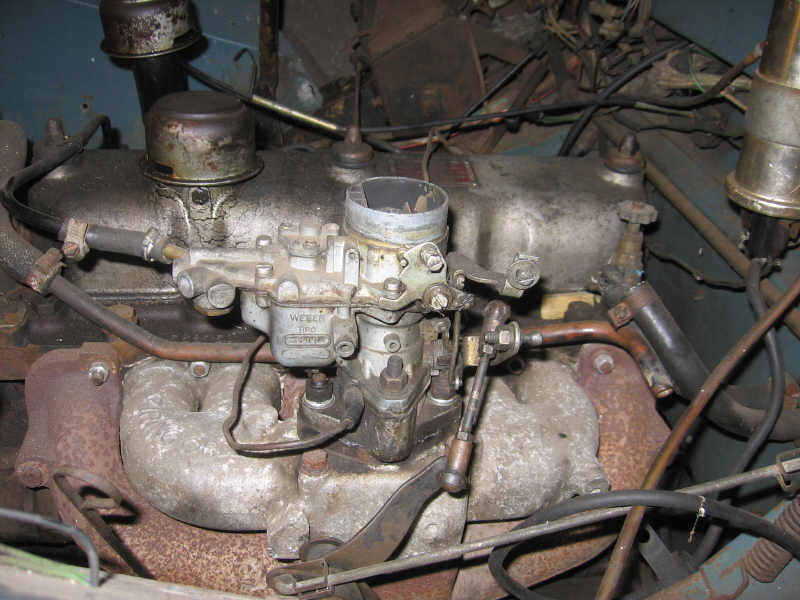 You may be better to have yours rebuilt - there are several carb specialists who can do this. A new Zenith can be fitted as a direct replacement for a Weber 34ICH (see below). It can also replace a Solex 40PA, but for this application you will need an adaptor plate and throttle linkage from a Zenith or Weber-equipped vehicle. 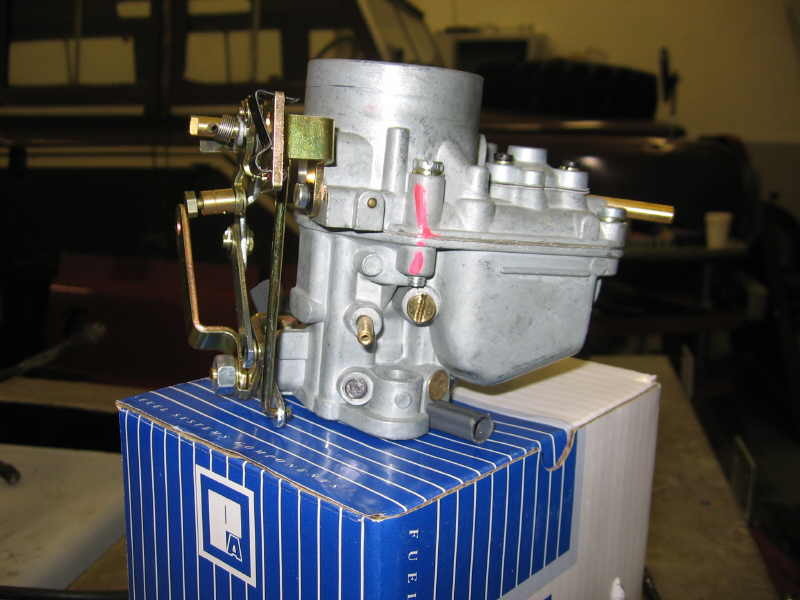 This carburettor became very popular in the 1980s when the supply of Solex parts dried up, and when the only source for Zeniths was the Land Rover dealer network. They were sold as a cheap replacement which also improved fuel economy. This is true up to a point, and the 34ICH is still available today at around £80, but it is not as popular as it once was. Reasons? Firstly, the fuel economy improvement is achieved through two things - firstly the carb is a bit small for the application, with restricted gas flow, and secondly it is jetted to run fairly lean. Taken together these two factors certainly improve economy, but really hurt performance. The Weber is also very prone to jet blockages (worse than the Solex) and, more seriously, internal fuel passage blockages that can be almost impossible to clear. It can also suffer badly from carb icing - it really needs a heated air intake which the Land Rover does not have. If your vehicle starts easily on cold mornings, but splutters to a halt after a couple of minutes, then restarts and runs as sweetly as before, carb icing is probably the cause. Oddly, not all Weber-equipped Land Rovers suffer from this problem - it varies from vehicle to vehicle, for no apparent reason. This is a twin choke carburettor, fitted to all four cylinder petrol 90 and 110 models. There are two slightly different versions, one for the earlier 2286cc engine and another for the 2495cc lump. They look identical, the only difference is in the jetting. The 2495 carb will work fine with the earlier engine, and gives noticeably better low speed throttle response, but not the other way round. 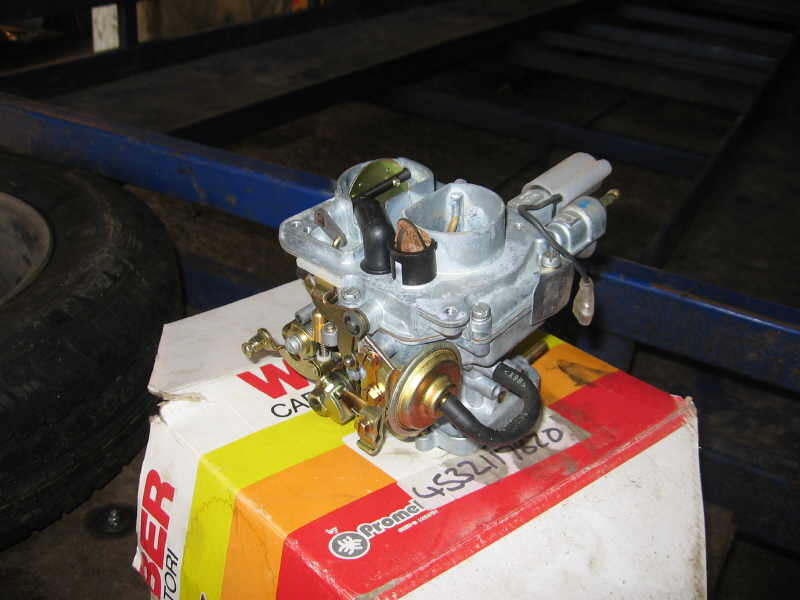 This carb is a good reliable piece of kit with few vices - mainly blocked jets (easily accessible after removing the plastic air intake over the carburettor). There is an idle shut off solenoid mounted on the side of the carb - if this fails the engine will not idle at all. This carb uses a different inlet and exhaust manifold to the Series carbs, and although the manifold will bolt to any of the 4 cylinder Series engines, you will need to make up your own front exhaust pipe as the Series pipe will not fit. The carb also has a cable operated throttle, whereas all the Series vehicles are rod-operated. This is a nice easy job and should be well within the capabilities of anyone who can change a light bulb without getting electrocuted. First things first: before removing your old carb, make sure that your ignition system is up to scratch. That means plugs in good condition and correctly gapped, points ditto, and ignition timing properly adjusted. You will not be able to get your vehicle to run smoothly if the ignition system is in bad shape. 1. When you remove the old carburettor, make sure you clean all the old gasket material off the manifold, and use a new gasket when you fit the new carb. Do not use silicone sealant ("instant gasket" as it has a nasty habit of getting into the air passages in the base of the carb. If you try to re-use the old gasket you will probably get air leaks which will make the carb impossible to set up. 2. Do not overtighten the nuts which secure the carb to the manifold. The carb is made of aluminium and the mounting flange is easily distorted. Again this will cause air leaks. Just tighten the nuts until the locking washers are compressed flat. 3. Make 100% sure that the fuel line is correctly connected and the clamps done up tight. If the fuel line is split or perished, replace it. The carb on these engines sits directly above the exhaust, and a petrol leak is seriously bad news. 4. Ideally you need a gas analysis machine to set the mixture, but you probably don't have one. So run the engine until it is warm, then adjust the idle screw until the idle speed sounds about right. Note that Series Land Rovers idle a bit slower than modern cars - around 600 rpm. The engine should not sound 'busy' at idle. If you have an earlier vehicle with dynamo charging, the charge warning light should be flickering, but not bright. Then slowly screw in the mixture screw until the idle speed drops and the engine starts to run rough. Unscrew it around a quarter of a turn from this point, and readjust the idle speed if needed. If the engine idles smoothly at the right speed, your settings will not be far out.